My post about Post-Christian Europe attracted several responses. Below I took the data from the chart rank ordering by belief in God. 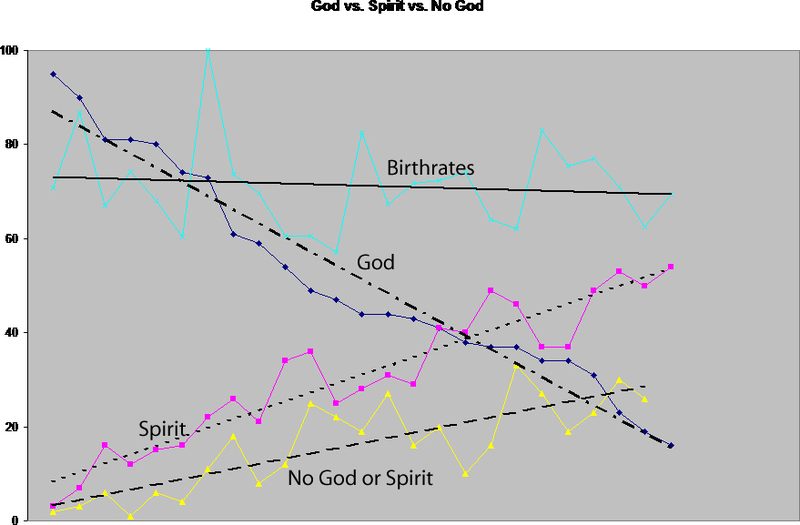 You note that as belief in God decreases, lack of belief in God or a Spirit increases as well, but belief in Spirit increases to a greater extent than lack of any belief at all. Note that 11% of Estonians are now explicit Neo-Pagans. Europeans aren't having children. Without the impetus of belief in a definitive God who rules the universe, having children just becomes an expensive nusiance. Most European countries are suffering net loss in population - save for those countries which continue to allow mass immigration from Arab nations. "Which of the following statements comes closest to your belief about God: you believe in God; you don't believe in God, but you believe in some other universal spirit or higher power; or you don't believe in either?"